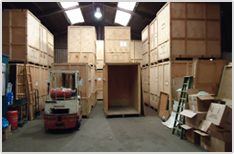 At FCR Removals we offer secure storage facilities, including containerised storage. We can provide storage for as long as you want whether it short term or longer term. Our storage warehouse is clean and dry. If you would like to view our storage facility please contact us on 020 8866 8225 or 07702 554835 to arrange an appointment. In the current property market secure storage can mean the difference between keeping and losing a sale. By placing your goods into storage it will allow you to move out of your property on time and let your buyers moving in.